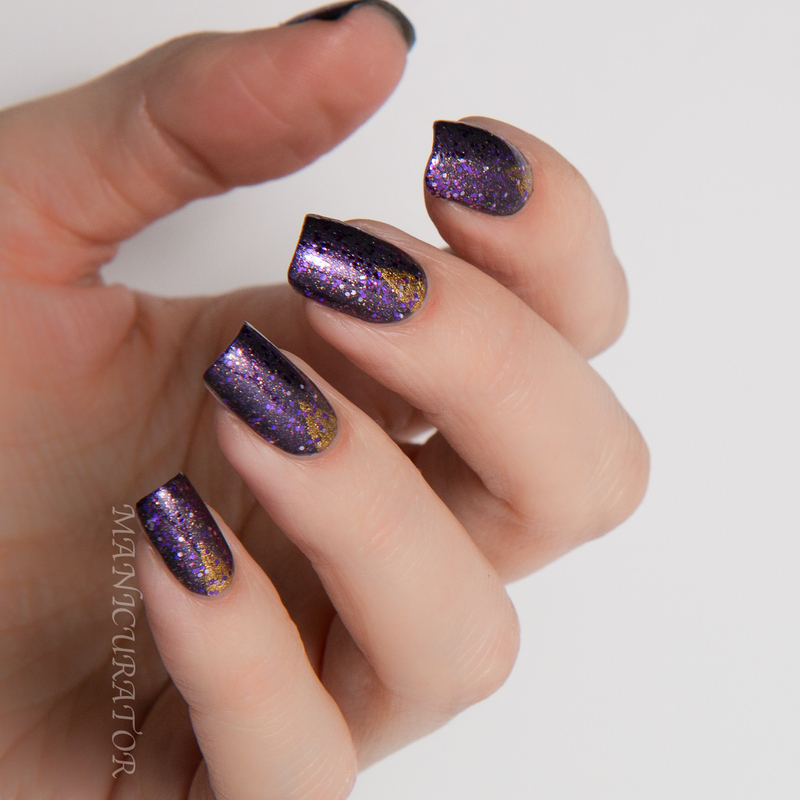 OK, so it's about time I showed you what was on my nails New Year's Eve? Right? At least it's still the first week in January! Ever since my move, I've been working towards getting that balance of home life and blog life just right. I'm discovering it will always be a work in progress and that some weeks will favor blog work but others, understandably will favor home/family life and that's ok with me! Home welcomes us w/ open arms & 6 eclectic new lacquers. Following the legends of the great nomads we embarked on a journey to see the world and reconnect with our true selves. The road was long but the greatest distance traveled was in our hearts. This holiday finds us home and filled with memories, lessons and gifts to share. Pewter with subtle hints of glitter, lavender shimmer or bright purple with bold layers of sparkle, and not-so-traditional holiday gold, red and green. I was a fan of this company from the first time I heard about them. Created by Shel Pink in 2004, with a clear idea of an enlightened consumer in mind, she called them SpaRitualists, and created a brand to honor the collective mind, body and spirit. SpaRitual products are widely found in Spas and it's no wonder. We believe that what we put on our bodies is as important as what we put in our bodies. 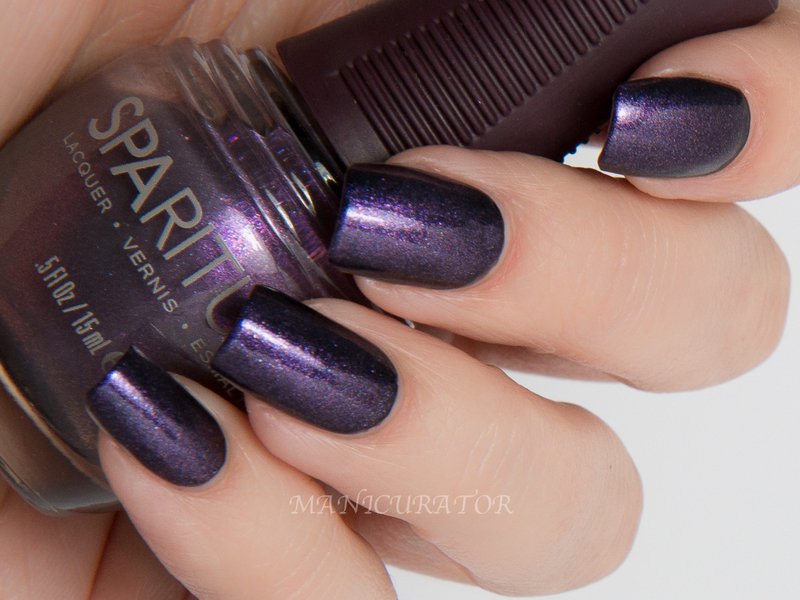 SpaRitual Spirit - a greyish lavender shimmer. This is the kind of shimmer that is very sheer on its own. At first I tried it on its own but realized fast it would need quite a few coats to reach the opacity that I desired. Instead, I used one coat over black and think it turned out beautifully. SpaRitual Finding - gold foil shimmer. 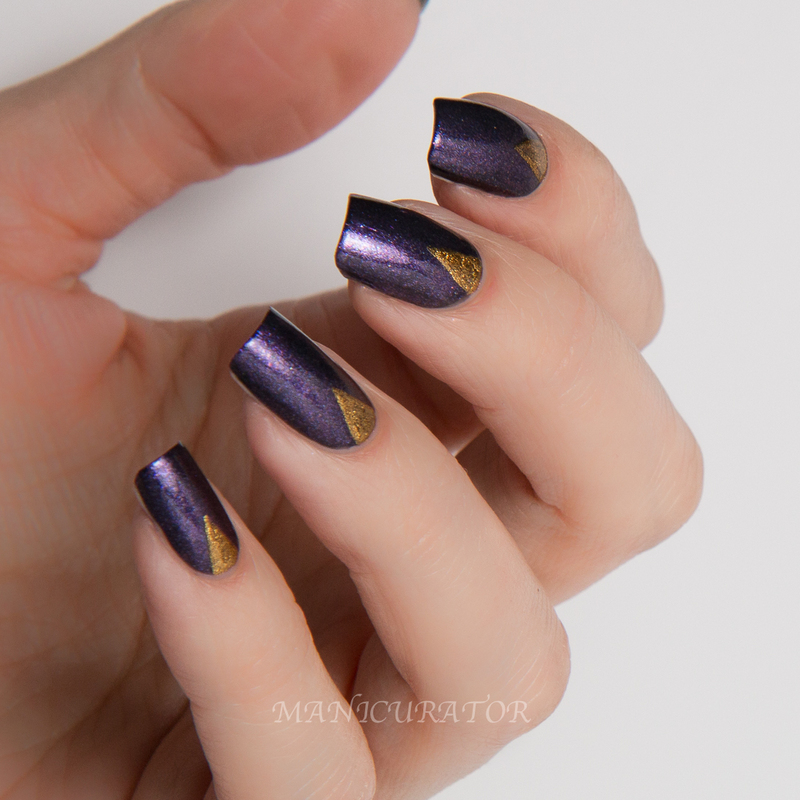 I used a small nail art brush to paint triangles with Finding. Beautiful gold foil, easy to work with and great coverage in one coat. 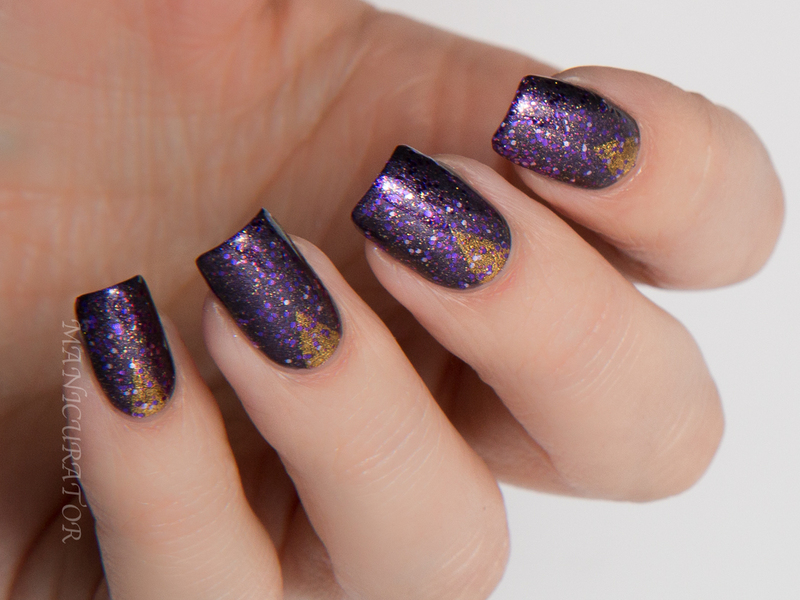 Can't have a New Year's celebration without glitter, right? Living has a great formula full of glitter but not so much that it bunches up and doesn't lay nicely. Hope your New Year is off to a good start! I've decided 2015 is the year I finally loose the baby weight. Ha! My twins are 5! :P Anyone else taking on new fitness goals? 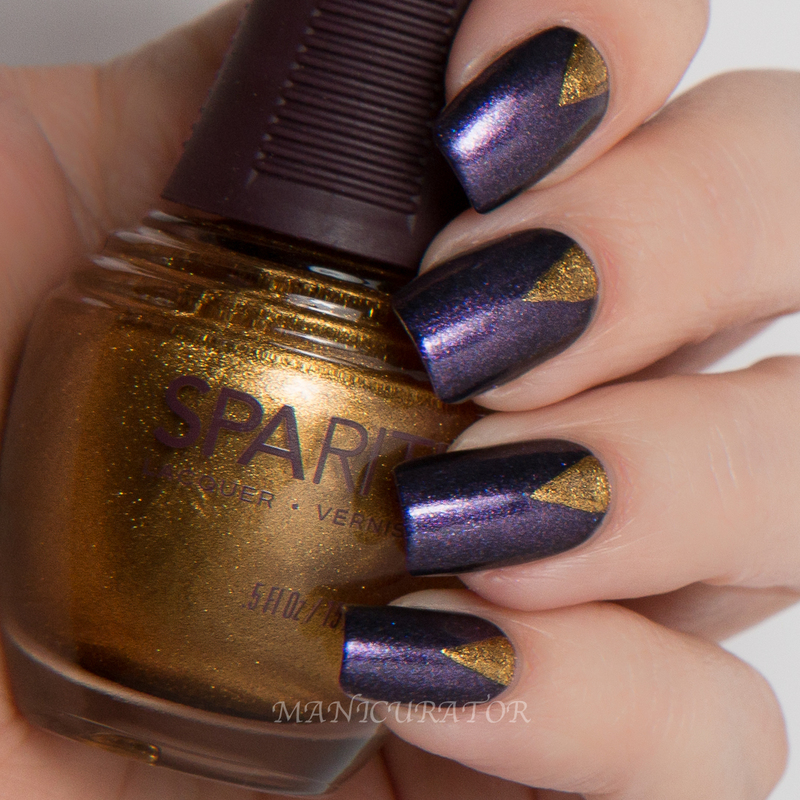 Spirit is a gorgeous shade and I love how they all look together! THIS!! What a great color combo! I love everything about this! Very pretty! 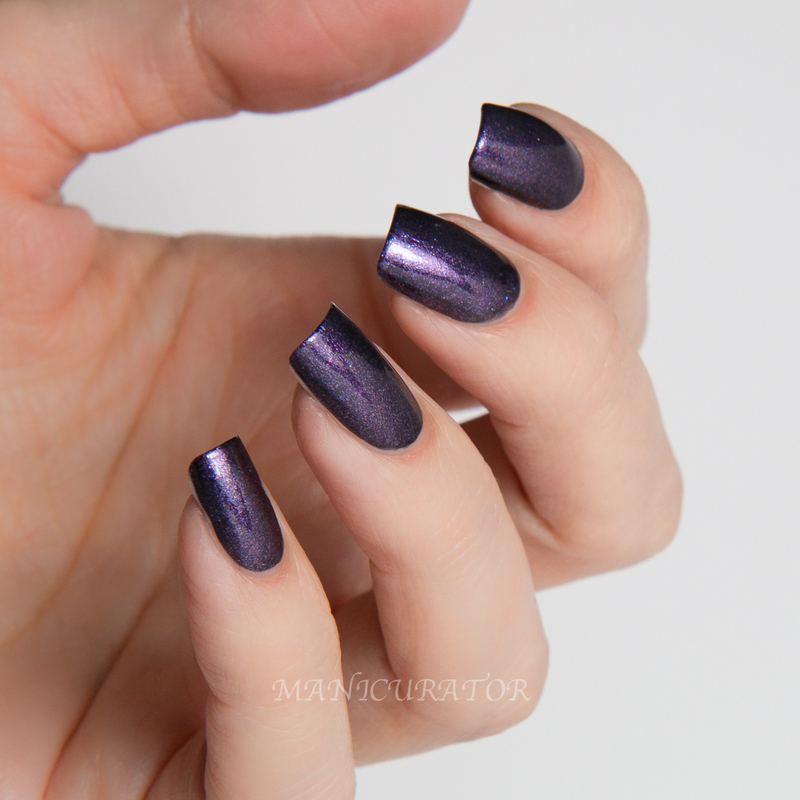 I haven't tried a SpaRitual polish in quite some time...but these are gorgeous! Beautiful nail art! I definitely need to get Finding, it's gorgeous! The combination of gold and purple is beautiful! 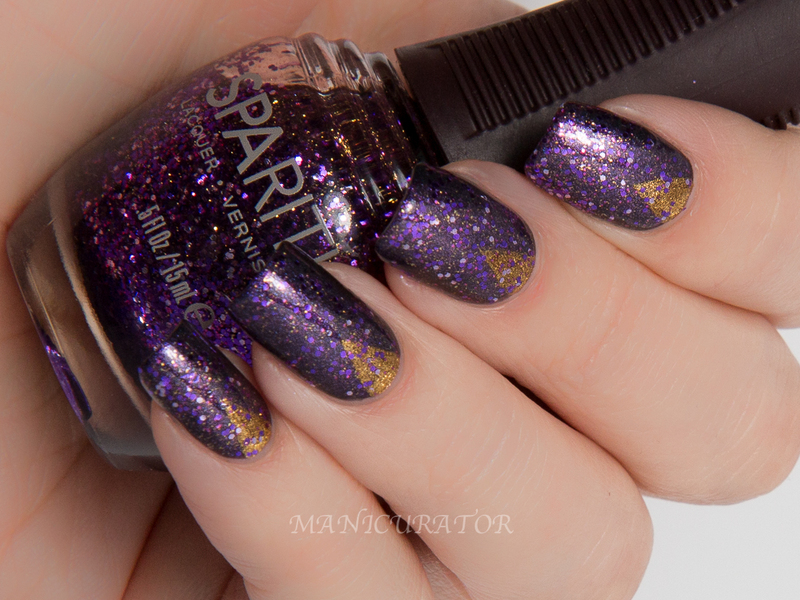 I've never tried a SpaRitual polish; good to hear that they are vegan and harm-free. Absolutely LOVE the nail art you did! <3 The purple and gold look so gorgeous together. Hi Victoria, SpaRitual is a brand that has only recently come into my realm of awareness. I visited their website and lingered for an hour, absorbing the calm and relaxing vibe. I will be purchasing some of their polish soon! I enjoy your nail art today. PS: good luck with the baby weight! The color go perfect together and I love the look you created! Very beautiful display of these two polishes!